We are engaged in offering a wide range of custom Flat springs, fabricated using high grade raw material that are die casted using advanced and high tech machines. 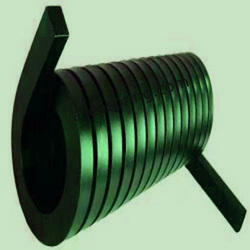 Flat springs are compression spring and widely used in press tools, moulds, pressure and die-casting. 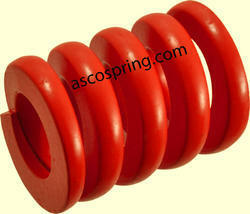 Asco range of die springs is known for high force low compression and optimum quality. Flat springs ensure high safety due to our international quality testing methods. Owing the team of expert engineers and workers, we are engaged in offering high quality range of Custom Flat Coil Springs. Custom Flat Coil Springs are widely used in various applications and are manufactured as per the requirements of our clients. Further, the raw material used in the manufacturing is procured from the reliable vendors of the industries. We are engaged in manufacturing an enduring range of Industrial Flat Springs, employing the best quality raw materials procured from our reliable sources. 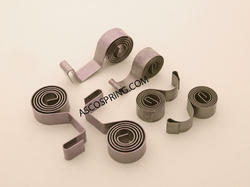 Asco Springs is a name, one can rely upon completely, as we offer the best quality products to our esteemed clients. We offer a comprehensive range of Flat Springs which is known its superior quality and cost effective prices. These are widely used to keep restricted space conditions in various products such as switches and relays & dies. Our products are available in various specifications of sizes, shapes & dimensions and can also be customized as per the client’s specifications. We offer a comprehensive range of Flat Wire Compression Springs which is known its superior quality and cost effective prices. These are widely used to keep restricted space conditions in various products such as switches and relays dies. Our products are available in various specifications of sizes, shapes dimensions and can also be customized as per the client’s specifications. Looking for Flat Springs ?